No longer called The Avengers (presumably because some people were expecting to see Uma Thurman and also Sean Connery in a bear suit) but now called Marvel’s Avengers Assemble (possibly the worst title ever), does the film live up to everyone’s exceedingly high expectations? Or is it a case of too many superhero cooks spoil the proverbial broth? You know the story by now probably: Nick Fury (Samuel L. Jackson) of S.H.I.E.L.D. needs help to take down the evil demigod Loki (Tom Hiddleston) who’s stolen the Tesseract (glowy cube thing seen in Thor). So Fury and the helpful Agent Coulson (Clark Gregg) enlist 4 superheros (Iron Man, Captain America, Thor and The Hulk) as well as 2 specialist agents from S.H.I.E.L.D. (Hawkeye and Black Widow) to stop him. Joss Whedon, writer, director and my personal hero, has done an incredible job with Avengers. He’s managed to write a script that combines the plots of the most of the other preceding superhero films (conveniently ignoring the awful previous Hulk films) that feature these characters and he’s managed to do it so that it actually makes some sort of sense. He’s also managed to write it and expertly direct it so that all of the supers get an equal look in. None of them feel left out or underused, which is definitely a job well done with a film that has such an amazing cast of characters. The ensemble cast is one of the main draws of the film and doesn’t disappoint. Robert Downey Jr. is of course excellent as Tony Stark/Iron Man, which we already knew from the Iron Man films. 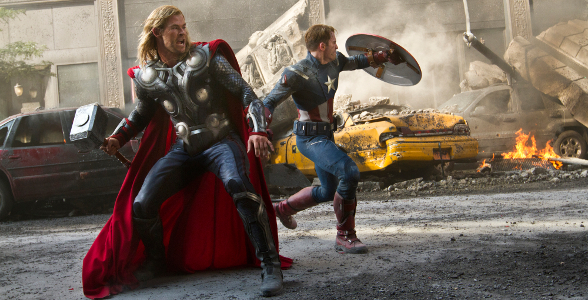 Chris Hemsworth as Thor and Chris Evans as Steve Rogers/Captain America both seem much more comfortable in their roles this second time round. Scarlett Johansson as Natasha Romanoff/Black Widow, who seemed like a pointless character in Iron Man 2, is here actually an interesting female character and gets something to do other than stand around and pout (although we all know Whedon could write good female characters from the evidence in Buffy). Jeremy Renner is also great as Clint Barton/Hawkeye, expanding on his very short cameo in Thor and actually getting to take part in the action this time. Baddie Tom Hiddleston as Loki is also brilliant and works well with the extra touch of humour that has been added to his character. But first-timer Mark Ruffalo as Bruce Banner/The Hulk is by far one of the best characters in this film, mostly because it’s interesting to see his interpretation of it after having Eric Bana and Edward Norton play the role before him. And he is by far the best Bruce/Hulk seen on film: he’s nervous and awkward all the time and looks very uncomfortable in his own skin. His green CGI persona is also the most impressive out of the other films as they’ve used advanced motion-capture technology to get Ruffalo to play both sides of the character, making Hulk seem much more human and real. One of the best things about Avengers though is, not only is it entertaining, it’s also very, very FUNNY. 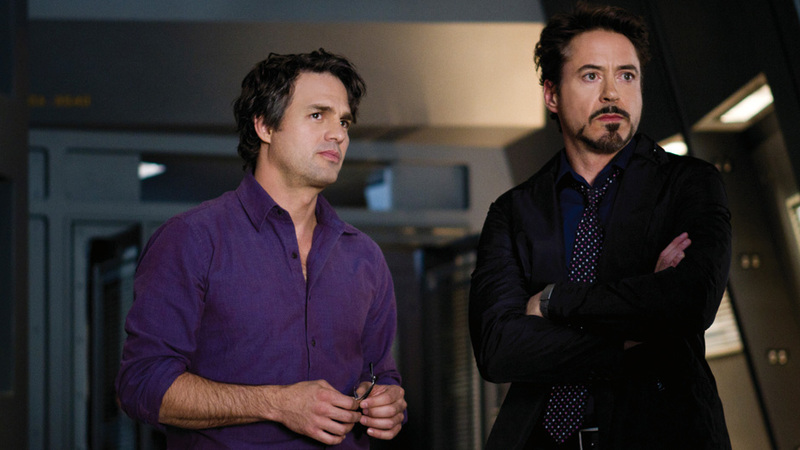 It’s the good old Joss Whedon humour throughout: the dialogue is snappy and the cast manage it well. There are also some amazing action scenes as the supers battle Loki, monsters, and sometimes each other in arguments between big egos. I went to see Avengers in IMAX 3D which is by far the best way to experience this film and to get the maximum impact of these mega action sequences. The colours don’t seem washed out like they do with normal 3D films, so it’s definitely worth the extra ticket price for the IMAX (although apparently it’s not playing on some of the bigger IMAX screens out there like the one in Manchester? – the screen is actually too big to show it so it’s only showing on smaller IMAX screens. Strange…). 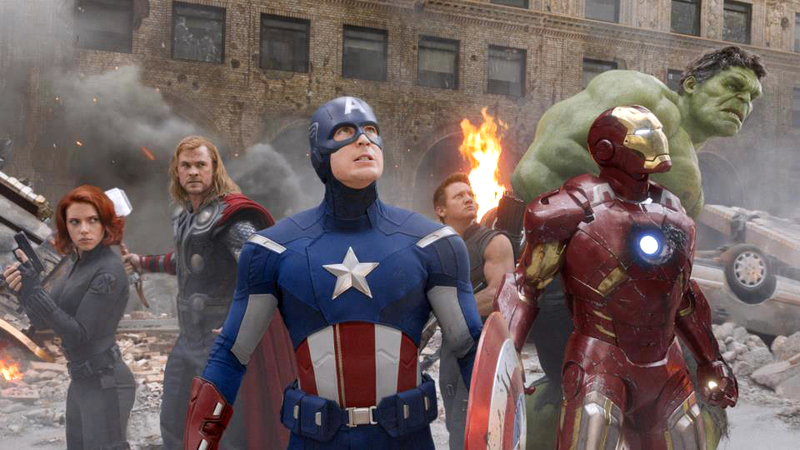 Avengers is also definitely one of the best superhero/comic book films made in recent years. It even surpasses the mighty Iron Man. You can clearly tell that Joss Whedon has huge respect for the original comics and all the characters as they are treated with such care and honour by him. He was certainly the best man for the job. And going by the (small) after credits scene, they’ve already got a sequel planned. In fact the only flaw with the film is how much you want to see a sequel IMMEDIATELY after it. We’ve got a good few years to wait, but still, BRING IT ON. ~ by square-eyed-geek on May 11, 2012. This entry was posted on May 11, 2012 at 6:14 pm and is filed under Film, Reviews.You can follow any responses to this entry through the RSS 2.0 feed.You can leave a response, or trackback from your own site.